Asbestos found during the revamp of a historic crossing under the River Tyne could have come from ship workers overalls, the project manager has said. 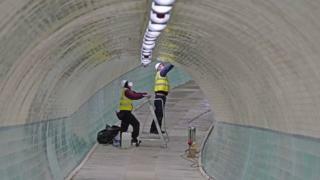 The Tyne pedestrian and cycle tunnel closed for renovations in 2013, initially for two years, but a series of setbacks pushed back the reopening. One of these was the finding of tiny asbestos fibres, of a different type from that used in its construction. After being given the all-clear, it is now expected to reopen by early summer. The 900ft (274m)-long tunnel, consisting of separate routes for pedestrians and cyclists, connects Howdon, north of the river, to Jarrow on the south. When it opened in 1951 as part of the Festival of Britain it was the first in the UK to be purpose-built for both modes of transport, and is now Grade II-listed. In 2013 it closed for restoration work, which included replacing two of the four wooden escalators with Italian-built glass lifts and replacing thousands of tiles. However, this was beset by problems, including the loss of three separate contractors. There was also the discovery of asbestos fibres, which would have lain undetected in nooks and crannies until unearthed during the restoration process. The £16m cost of the project is now more than double the original £6.5m budget. Richard Simpson, from tunnel operators Tyne Tunnels, described the tunnel as "part of Tyneside's industrial heritage" which would be linked to national cycling routes and become an attraction in its own right. He said: "There's a lot of reasons to can look forward to a bright future."